Ha, chuckle…..sounds very familiar, Nam!! It’s quite challenging to get good photos isn’t it? Though I think your photos are always great!! Hello Kay! Thank You so much for your kind words! Alas, my photography is such a work in progress 🙂 hahah…. Cheers! Boy, I’m with ya sister. Once I actually took 84 photos and came out with 3 good ones. But let me tell you, this photo STILL looks great! You’re being too hard on yourself, as a matter of fact, it looks so good, I’m gonna add it to my Must Make List! Keep Snapping Away! Hi Sally! I must admit to you that I’ve often taken over a 100 photos for one shot—hahaha 🙂 Thanks for the words of encouragement! This looks like some serious comfort food. 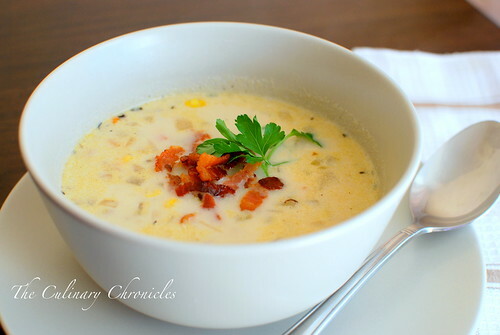 I think the photo is just beautiful…of course, when we’re talking corn chowder…how could it not be? Great recipe! Hahaha Jason always complains about having to wait forever until he can eat haha! But obviously this photo is still great… I mean, it made it onto TasteSpotting! As for Tastespotting—I was surprised to see it! hahahahhah….. I think the photo is lovely! And I loooove corn chowder!